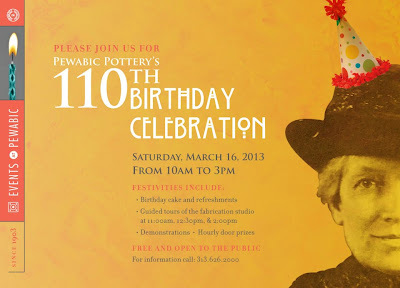 Guests at this Saturday's Pewabic Pottery birthday celebration will enjoy giveaways, birthday cake, refreshments and demonstrations from talented ceramic artists. Guided tours of Pewabic’s museum and fabrication studio will also be given at 11 a.m., 12:30 p.m. and 2 p.m.
-Founded in 1903 by Mary Chase Perry Stratton and Horace Caulkins and produces first commission for Burley and Company in Chicago. -In 1907 moved to its current East Jefferson location, designed by architect William Buck Stratton. -In 1909 introduced signature iridescent glazes. -In 1928, Pewabic’s Saarinen house fireplace is featured at the Metropolitan Museum of Art in New York City. -In 1937 featured in an exhibition of ceramic art at the Whitney Museum of Art in New York City. -In 1947, founder Mary Stratton is awarded the coveted Charles Fergus Binns medal, the nation’s highest award in the field of ceramics. Pewabic wins this prestigious award again 1993. 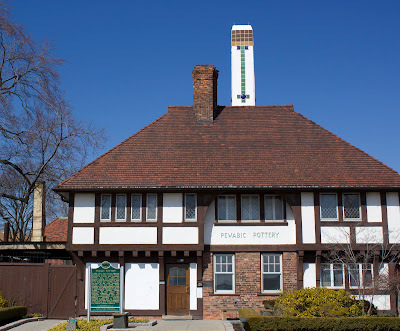 -In 1971, Pewabic Pottery is named to the National Register of Historic Places. -In 1991 the pottery and its contents were recognized as a National Historic Landmark. -In 1999 created murals for Comerica Park, the new home of the Detroit Tigers. -In 2012 launched Copper & Clay: Pewabic’s New Leadership Initiative, a committee of engaged, young professionals providing skills and experience in support of the nonprofit’s mission. Saturday, March 16 from 10 a.m. to 3 p.m.